Kaffir Lime Oil (Indonesia) - Ultra International B.V.Ultra International B.V.
Kaffir Lime Oil Indonesia Citrus Hystrix L.
Kaffir Lime is a citrus fruit very similar to traditional lime but it is small in size and has a unique, rough, bumpy green skin. Unlike a regular lime tree, its leaf actually resembles two connected leaves. The leaves have a very strong, characteristic fragrance that cannot easily be substituted by other spices or even from oils extracted from other plants in the same family. Indonesian kaffir lime is primarilly produced from the East Java region, however it is known to grow in other tropical climates like that of Madagascar and Thailand. To grow kaffir lime seedlings are planted in warm, temperate spaces. Leaves should be clipped often to ensure proper growth and on reaching maturity, the leaves are plucked and sent for distillation. 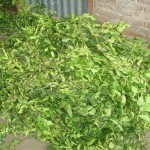 The fresh green leaves of the kaffir lime tree are then steam distilled to obtain oil. The export quantities lie in the range of 2 to 3 Metric Tons, and tend to remain stable with little or no fluctuation in quantities or prices. Each part of the kaffir lime offers something different, whether it be the leaves, fruit, oil or rind. 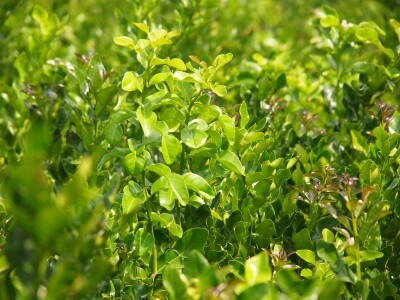 The leaves are often found in many Thai dishes in particular in soups and sauces like Tom Yum soup. The strong flavour is caused by high concentrations of citronellol, limonene and nerol. Not only are these beneficial to the flavours but are the reason why kaffir lime has so many health benefits associated with it. In a nutshell you can summarise kaffir lime as providing benefits to help detoxify blood, promote good oral health, stimulate digestive system, reduce appearance of scars and wrinkles, good insect repellent, strengthen immune system and good male hair & scalp scare (as it reduces the process of balding and prevents dandruff). With all these benefits and a unique and powerful flavour it’s surprising we don’t see kaffir in more products. Maybe that will soon change? Botanical name: Citrus Hystrix L.